Resistors are current limiting devices with are used abundantly in electronics circuits and products. There are various types of resistors. We will discuss some of them below. Resistors are differentiated based on power dissipation, application, and design. For most of application we use ¼ watt-Through hole-Carbon coating type resistors. These are very important for electronic students and hobbyists as they are easy to get and to use. And they are cheap. The above picture shows quarter watt-through hole-carbon type resistor. These resistors are abundantly used as they are cheap. These are breadboard friendly resistors and so an electronic students and hobbyists finds ease in designing circuits with these resistors. Resistance are measured based on the color bands on the resistors. Generally there are 4-band, 5-band and 6-band resistors are available. You can calculate the resistance of these resistors using this resistor color code calculator. These are a quarter watt resistor that means these types of resistors can not dissipate more than quarter watt through body in normal room conditions. So these can drive a current ( √0.25/R). If this limit crossed the resistor gets damaged. The above picture shows half watt-through hole-carbon type resistor. These resistors are abundantly used as they are cheap. These are also breadboard friendly resistors and so an electronic student finds ease in designing circuits with these resistors. These are a half watt resistor that means these types of resistors can not dissipate more than half watt through body in normal room conditions. So these can drive a current ( √0.5/R). If this limit crossed the resistor gets damaged. The above picture shows one watt-through hole-carbon type resistor. 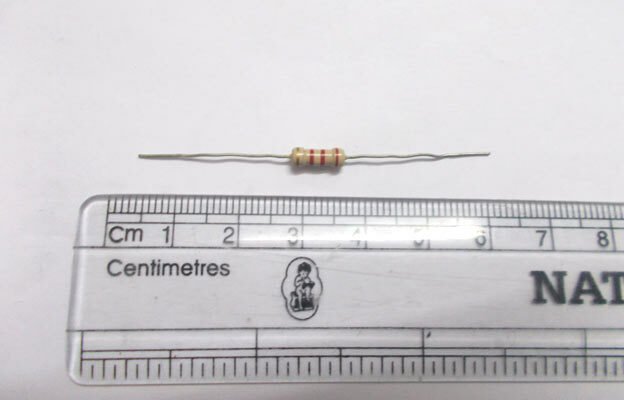 These resistors are used occasionally as they are not so cheap. These are not breadboard friendly resistors and are not preferred while designing. These are one watt resistor that means these types of resistors cannot dissipate more than one watt through body in normal room conditions. So these can drive a current ( √1/R). If this limit crossed the resistor gets damaged. These are SMD (Surface Mount Device) type resistors. These can be found in PC mother boards, mobile phone or any embedded circuits. These are used when the driving currents are limited to 1-2 milliAmperes any current higher than that will damage the device. These are used while making mass production circuits. These are not breadboard friendly. They are the cheapest of all types. The SMD resistor are available in different sizes, 0804 type is mostly used type and is shown in figure. These are manufactured as a strip as shown in figure. These are placed on PCB board by pick and place machine, and these soldered to board by over flow or by oven method.